It's funny how things work in the blogging world. There are weeks when you start sending yourself emails to check your account still works and other times when your inbox becomes overwhelming. This is not a complaint but I hope it explains why I have blogged two candle reviews in quick succession. We all know that joke about buses, well it my case its candles. I connected with Nathalie on Twitter, she’s the creator behind Petits Rituels*, a luxury brand of organic aromatherapy candles, handcrafted in England with 100% natural wax and essential oils. I was delighted to be offered a candle and was blown away when a beautiful parcel arrived on my doorstep. The scents filled the room before I had even opened the box. Out of the two candles I received it has been Minty Bonbon that has “spoken” to me. The blend of peppermint and lemongrass is truly wonderful. What I like most is I don’t even have to burn this candle to enjoy the aroma. It is clear that Nathalie has paid a lot of attention to detail, not only are the blends beautiful but I adore the presentation. The glass holder is elegant and weighty which gives a luxurious look. I even feel slightly guilty at the thought of throwing away the pretty floral box. 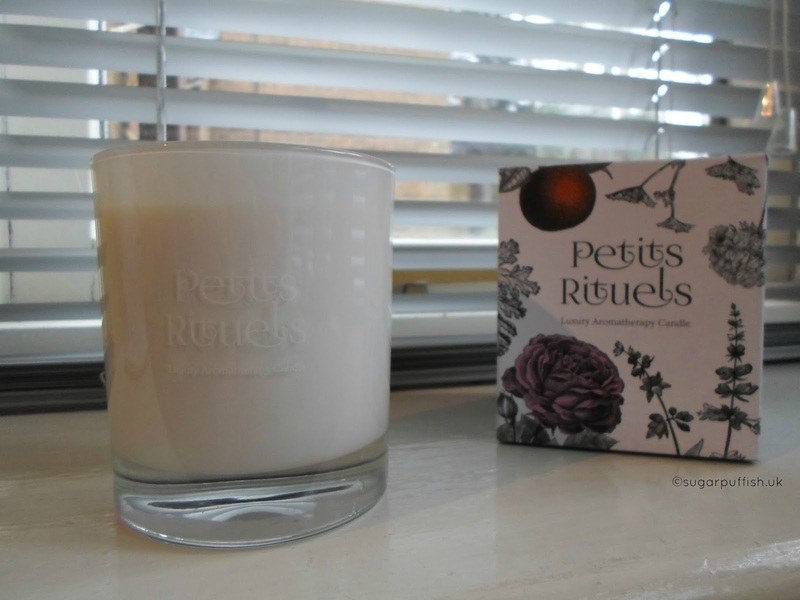 I am more than happy to recommend Petits Rituels candles. They are luxurious and that is reflected in the price (£35 - 200g) but this is comparable to other brands on the market, including those with inferior ingredients. The burn time is 40 hours and these candles are perfect for gifting to friends or yourself. Petits Rituels are offering my readers a 10% discount on all orders using the code SUGAR10 (offer ends 30th May 2015) and a free maxi scented tealight if you subscribe to Petits Rituels' newsletter. Happy Shopping everyone! Do come back and let me know which scent you ordered.